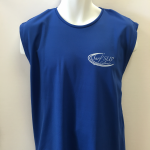 This comfortable sleeveless shirt is made from our loosefit water resistant Koredry material and is designed for the water. It fits like a t-shirt, but the Koredry fabric doesn't get wet at the fibers core so you stay comfortable in and out of the water. Even after being fully submerged, the loosefit fabric holds it's shape without getting soggy and baggy. These shirts provide great insulation, but are also breathable, since they don't have a membrane like other water repellent shirts. They offer full UPF 50+ protection from the sun (the maximum designation for fabric), so you can stay out longer. A favorite among stand up paddleboarders, our loosefit shirts feature raglan sleeves and flatlock stitching for ultimate comfort and flexibility.